XIV Corps cleared the southern shore of Manila Bay while XI Corps was making its drive to secure Bataan.1 In fact, elements of the 511th Parachute Infantry, 11th Airborne Division, occupied Cavite Peninsula and adjacent mainland areas on the same day that the 151st Infantry, 38th Division, landed at Mariveles, Bataan. Affairs at Ternate, about twenty miles southwest of Cavite, moved in a different fashion. Here was located a Japanese garrison of about 1,000 men built around the 111th Surface Raiding Base Battalion and attached units, including a few pieces of artillery. In addition, around 350 naval personnel who had recently evacuated Carabao Island in Manila Bay also holed up at Ternate. The capture of Ternate marked the completion of XIV Corps' share in operations to secure Manila Bay, for on the same day the corps' troops had overcome the last organized resistance within Manila. 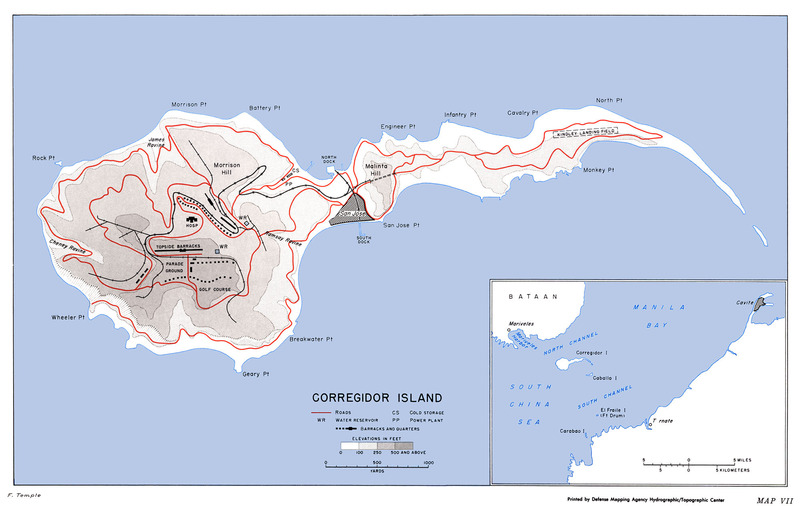 XI Corps had already reduced all Japanese opposition along other points on the bay's shores and had secured Corregidor. 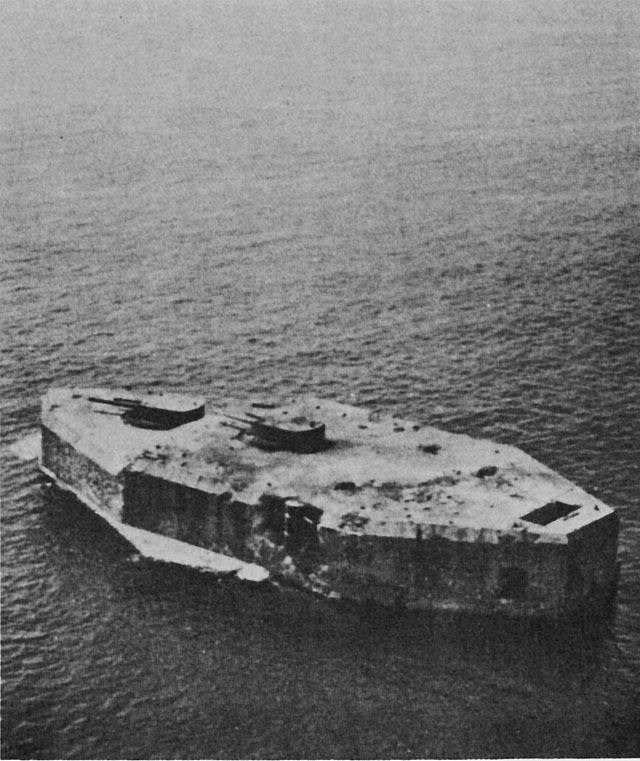 All that remained was to clear the small islands between Corregidor and the south shore. 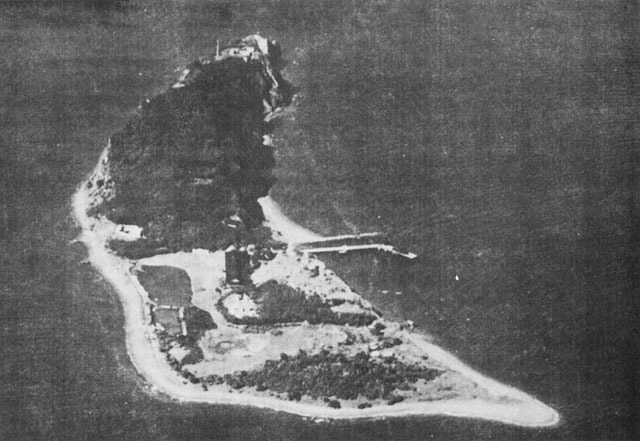 The small islands that XI Corps had to secure were Caballo, a mile south of Corregidor; Carabao, hugging the Ternate shore; and El Fraile, about midway between the other two. The Japanese on those islands posed no threat to Allied shipping--their ordnance was too light--but, like other bypassed Japanese garrisons, they had to be taken sometime. Although the islands had little or no military significance, the operations to secure them offer interesting examples of military ingenuity and unorthodox tactics. There was no great hurry to launch attacks against the three minor objectives and it was, indeed, past mid-March before XI Corps could spare any troops for the job. On the 18th General Chase, the 38th Division commander, requested and received permission from XI Corps to reconnoiter Caballo Island.4 The next day a platoon of the 2d Battalion, 151st Infantry, took off from Corregidor by LCM and landed unopposed at the eastern end of Caballo. Patrolling inland, the platoon discovered strong Japanese defense on high ground in the center of the island, which was only a mile long, east to west, and 500 yards wide. and rocket-equipped PT's bombarded for twenty minutes; artillery on Corregidor and Bataan joined in; and 151st Infantry 81-mm. mortars lobbed shells over from Corregidor. At 0900 LCM's of the 592d Engineer Boat and Shore Regiment began putting the assault infantry ashore. At first there was no opposition. The Japanese garrison of some 400 Army and Navy troops was stunned or was hiding in defenses centering around three small knolls that, varying from 150 to 250 feet in height, lay near the middle of the island.5 Within fifteen minutes the 2d Battalion, 151st Infantry had secured Hill 1, the most easterly, and had begun an advance toward Hill 2. At Hill 2 concentrated machine gun, mortar, and rifle fire as well as the hill's rough, steep slopes slowed the attack. Nevertheless, the battalion captured the crest by the end of the day. Within another day it cleared all Caballo except for a group of approximately 200 Japanese who had retired to prewar mortar pits and tunnels near the base of Hill 2's eastern slopes. The Japanese in the pits and tunnels created an almost insoluble problem for the 2d Battalion, 151st Infantry. The Japanese had so emplaced their weapons, which included machine guns and mortars, that they controlled all approaches to the mortar pits but could not be reached by American artillery or mortar fire. When the 151st Infantry concentrated its mortar fire against the pits' entrances, the Japanese simply withdrew into the tunnels. When the American fire ceased--at the last possible moment before an infantry assault--the Japanese rushed out of the tunnels to man their weapons. Tanks were of no help to the American troops. From positions near the rim of the pits the tanks were unable to depress their guns sufficiently to do much damage to the Japanese. If the tanks tried to approach from above, they started sliding down Hill 2's slopes into the pits. No combination of tank, artillery, and infantry action proved of any avail, and the 151st Infantry had to give up its attempts to take the Japanese positions by assault. On 31 March engineers tried to pour diesel oil into one of the tunnels connecting the mortar pits, employing for this purpose a single ventilator shaft that was accessible to the 151st Infantry. Nothing came of the effort since it was impossible to get enough oil up the steep slopes of the hill to create a conflagration of significant proportions within the tunnels. Nevertheless, burning the Japanese out seemed to promise the only method of attack that would not risk the unduly heavy casualties of a direct infantry assault. No one, of course, wanted to throw away the lives of experienced troops on such an insignificant objective. On 5 April over 2,500 gallons of diesel fuel were pumped into the pits and tunnels through the ventilator and were then ignited by white phosphorus mortar shells. "Results," the 38th Division reported, "were most gratifying. "7 A huge flash fire ensued, followed by a general conflagration and several explosions. The engineers repeated the process on 6 and 7 April, and on the latter day carefully lowered two large demolition charges through the ventilator shaft and placed another at an accessible tunnel entrance. Set off simultaneously, the three charges caused an enormous volume of flames and several terrific explosions. For the next few days the 2d Battalion, 151st Infantry, tried to persuade a few Japanese who had lived through the holocausts to surrender and also executed a few infantry probing attacks. On 13 April a patrol entered the pits and tunnels, killed the lone surviving Japanese, and reported the positions cleared and secured. bridge to the top of Fort Drum. While the infantry covered all openings, engineers followed across the ramp with an oil line and 600 pounds of TNT. The LCM employed at Caballo Island then began pumping oil into an open vent and engineers lowered TNT into another opening. After the engineers lit a 30-minute fuze, all hands withdrew and the LCM kept pumping. Suddenly, rough seas broke the oil line. Maj. Paul R. Lemasters, commanding the 2d Battalion, 151st Infantry, together with a few enlisted men, dashed back over the ramp to cut the demolition fuze with only minutes to spare. Engineers then repaired the oil line and resumed pumping. The Japanese inside Fort Drum were strangely quiet throughout all this activity, although a few rifle shots from an old gun port wounded a seaman aboard the LSM. Pumping continued without incident, and shortly after 1020 the LSM, the LCM, and a few LCVP's that had kept the LSM alongside the fort, pulled off to a respectful distance. By that time nearly 3,000 gallons of oil had been pumped into the ventilator. The initial explosion, occurring about 1035, proved a disappointing, weak, and scarcely noisy failure. 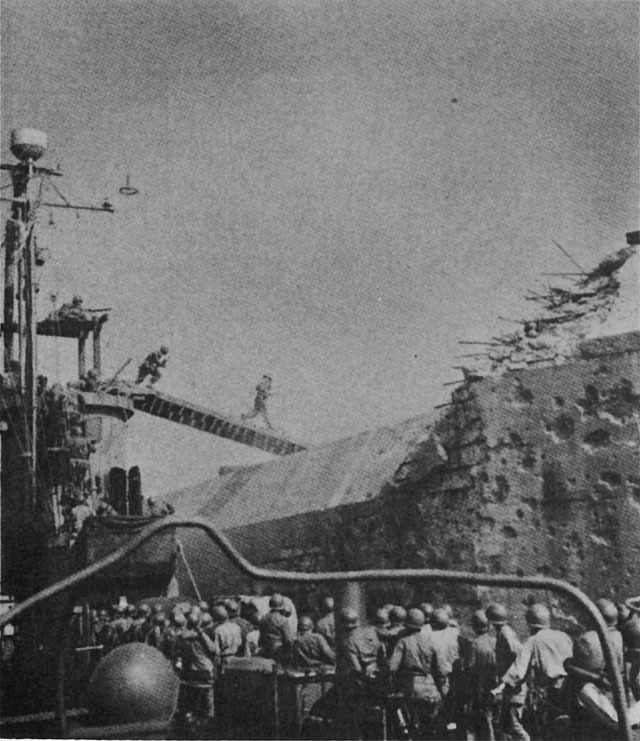 But while the commanders concerned were gathering aboard Admiral Barbey's flagship to discuss the failure, burning oil seeped through openings created by the first explosion and reached the fort's magazines, most of them containing ammunition from 1942 that the Japanese had never hauled away. At approximately 1045 there was a deafening roar from the fort. Great clouds of smoke and flame shot skyward; a series of violent explosions threw steel plates and chunks of concrete hundreds of feet into the air and a thousand yards out to sea; smoke and flames poured from every vent, gun port, shell hole, and sally port. The holocaust exceeded all expectations. 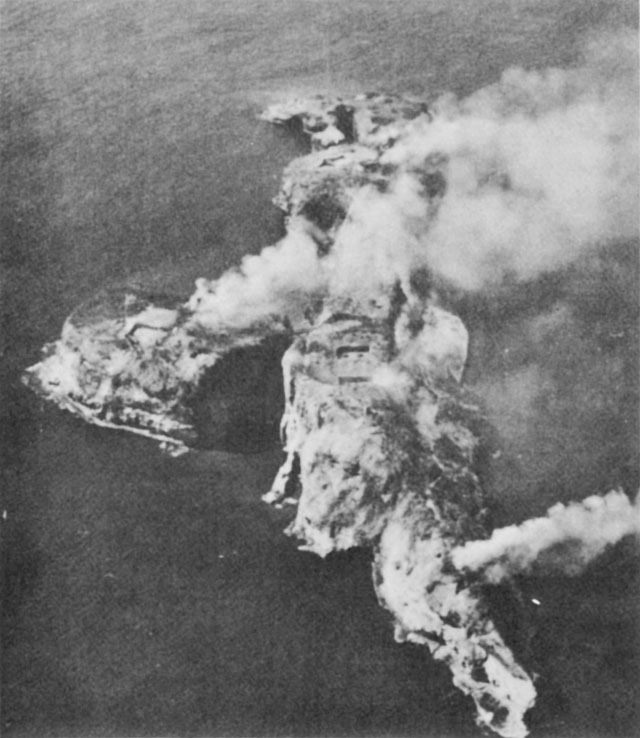 Fires and explosions of some magnitude continued until late afternoon, while smoke, heat, and minor explosions made reconnaissance of the fort's interior impossible until 18 April. On that day infantry patrols penetrated Fort Drum's innermost recesses and found 69 Japanese bodies. The entire Japanese garrison of a seemingly impregnable stronghold had been wiped out at the cost to the attackers of one man wounded. shore, was the last objective in Manila Bay.11 Two days of air and naval bombardment preceded the attack. The 1st Battalion encountered no opposition, and the only living being it found on the island was one very badly shaken pig. The 350 Japanese naval troops who had once garrisoned Carabao had withdrawn to the mainland at Ternate.12 The disposition of the pig they left behind is not noted in the records, but it would not be unreasonable to assume that some of the men of the 1st Battalion, 151st Infantry, had fresh pork chops for supper on 16 April 1945. With the seizure of Carabao Island, XI Corps brought to a successful conclusion its campaign to secure the entrance to Manila Bay. The bay had actually been safe for Allied shipping since 16 February, the day of the assault on Corregidor, and Allied vessels began using the great harbor of Manila well before the seizure of Carabao. The capture of Carabao, El Fraile, and Caballo was but a minor side show in the Luzon Campaign, and the operations to take the three islands had diverted only a miniscule portion of XI Corps' energies--its main strength had long since moved against the Shimbu Group on the mainland. 1. This section is based upon: 11th A/B Div Rpt Luzon, pp. 7, 15-18, 30; 11th A/B Div G-3 Per Rpts, 15 Feb-4 Mar 45; 511th Prcht Inf S-3 Jnl, 15-20 Feb 45; 188th Gli Inf Rpt Luzon, pp. 10-12. 2. See above, ch. XIII. 3. The author could find no casualty figures for the Ternate action in available records, but General Swing, the 11th Airborne Division's commander, stated that the battle cost the 188th Infantry "significant casualties." Swing Comments, 10 Jan 57. 4. The account of the capture of Caballo is from: 38th Div Rpt Luzon, pp. 50-54, 123-24 and map after p. 49; 151st Inf Rpt Luzon, Caballo Account; 151st Inf S-2 and S-3 Jnls, 27 Mar-13 Apr 45; Sixth Army Rpt Luzon, I, 78; TU 78.9.11, Action Rpt, 27-28 Mar 45, Opns Caballo Island, passim. 5. Additional information on the Japanese on Caballo is from Japanese Studies in WW II, No. 125, Philippine Area Naval Opns, pt. IV, pp. 16-18. 6. In addition to sources cited previously, the description of the oil operations at Caballo is derived from Brig. Gen. William F. Heavey, Down Ramp! The Story of the Army Amphibian Engineers, (Washington: Infantry Journal Press, 1947), pp. 155-56. 7. 38th Div Rpt Luzon, p. 52. 8. Rpt of the Harbor Defenses of Manila and Subic Bays, p. 4 (an. VIII to Rpt of USAFFE and USFIP, 1941-42, otherwise known as Wainwright's Rpt), OCMH files; Morton, Fall of the Philippines, pp. 478ff. 9. Teletype Msg, G-2, XI Corps to G-2 Sixth Army, 1430 5 Mar 45, Sixth Army G-3 Jnl File Luzon, 3-5 Mar 45. 10. The story of the reduction of Fort Drum is based on: 38th Div Rpt Luzon, pp. 55-60; 151st Inf Rpt Luzon, Fort Drum Account; Heavey, Down Ramp!, pp. 156-57; USS LSM 51, Action Rpt Fort Drum, passim; Japanese Studies in WW II, No. 125, Philippine Area Naval Opns, pt. IV, p. 18. 11. The Carabao (Fort Frank) story is based on: 38th Div Rpt Luzon, pp. 61-64, 126-27; 151st Inf Rpt Luzon, Carabao Island Account; Japanese Studies in WW II, No. 125, Philippine Area Naval Opns, pt. IV, pp. 18-19; TU 74.3.5, Action Rpt Carabao Island, passim; Heavey, Down Ramp!, p. 157. 12. For the subsequent history of these Japanese naval troops, see the first section of this chapter and also Chapter XXIII, below.